Furniture and accessories play a big role in your exterior design, adding the form and function to your layout and transforming your outdoor space from “OK” to “perfect”. Outdoor furnishings come in so many materials, color palettes and aesthetics — there really is something for every style and use. 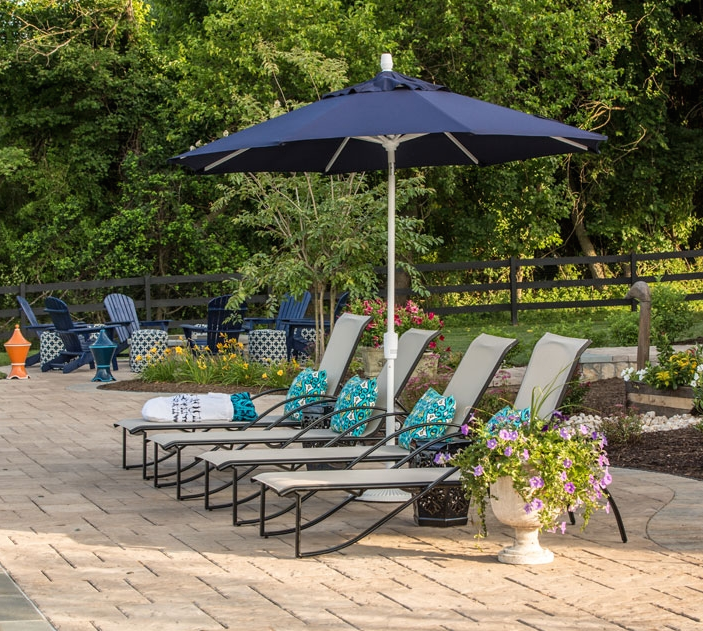 We always tell our clients that it’s important to follow a few basic rules when adding outdoor furniture and accessories to complete your exterior. Identify your goals. What do you need the furnishings to accomplish? Do you need seating for many people? Do you want to provide shady seating as well as options for lounging in the sun? Will you be spending time outdoors in the evenings or days, or both? Will you be entertaining and dining outdoors? Knowing the answers to these questions will really help you create a plan for your outdoor space that includes the type of furniture you want and where it might be placed. Express your style. We are big believers in expressing your personality and living comfortably. Your outdoor space should flow from the indoors. Use your outdoor design to create a vibe that is uniquely yours and one that takes you (and your family) to your happy place every time. Materials, colors and form will all contribute to the overall feeling of the space. If you’re not completely sure that you have a personal style, or if you’re looking to change things up but not sure of the direction you want to take, don’t worry. We can help you discover the style and direction that really suits your individual taste and functions seamlessly with your family’s lifestyle. Connect the dots. Think about your outdoor design in the same way as you would the inside of your home. There are several “rooms” where different things take place — lounging, eating, playing and more. The key to a fabulous and functional design is to connect each of these areas so that they flow naturally and gracefully from one setting to the next. Using accessories, lighting and flooring that complements each other will help tie things together. Do your legwork. Furnishing an outdoor living space involves much more than flipping through a catalog or going online to select furniture. To get the exact pieces and accessories that will reflect your family’s individual passions, you need to go beyond what is available for the masses. From fabrics available only to wholesalers and designers to vintage one-of-a-kind items found when scouring antique shops — there is a plethora of outdoor accessories and furniture that can be customized to make a statement that is uniquely yours. Get some help. Whether you’re decorating a petite patio or a grand garden, it takes time and work. Sometimes it’s better to get some help from a professional who knows how and where to source and implement the furnishings and accessories that will give the space ultimate utility along with elegant expression. Interior and exterior designers have access to a world of wholesale goods, plus they’re on top of the latest trends. A good designer will help you find your “voice” — using color, material, form and placement that reflects who you are and how you live. For more information on designing, furnishing and accessorizing your home’s exterior, contact Grace Thomas Designs today.